The Directorate of Admissions of OU had conducted OUPGCET examination held successfully at different centers ,results also announced.Now OU officials are going to conduct counselling through web based. All the candidates, who have qualified in Osmania University Common Entrance Tests - 2015 for admission into various P.G. courses (M.A., M.Sc., M.Com., M.S.W., M.C.J., B.L.I.Sc./M.L.Sc. 2 yrs. Course, etc.) 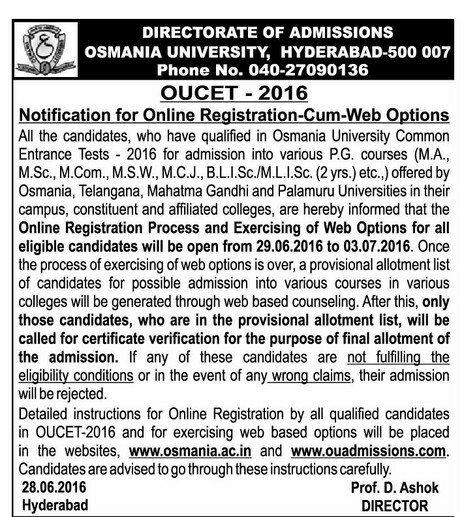 offered by Osmania, Telangana, Mahatma Gandhi and Palamuru Universities in their campus, constituent and affiliated colleges, are hereby informed that the Online Registration Process and Exercising of Web Options for all eligible candidates will commence from 29.06.2016 to 03.07.2016 Once the process of exercising of web options is over, a provisional allotment list of candidates for possible admission into various courses in various colleges will be generated through web based counseling. After this, only those candidates, who are in the provisional allotment list, will be called for certificate verification for the purpose of final allotment of the admission. In case if any of these candidates is not fulfilling the eligibility conditions or in the event of any wrong claims, his/her admission will be rejected. Detailed instructions for Online Registration by all qualified candidates in OUCET-2015 and for exercising web based options will be placed in the websites, www.osmania.ac.in and www.ouadmissions.com. Candidates are advised to go through these instructions carefully. 1. All the candidates, who have qualified in OUCET-2015 entrance tests can exercise web based options in the respective subjects and choose the colleges as per the candidate’s preference. However, in certain subjects and under certain special categories, the admissions process will be conducted at a later date. The details are given at the end of these instructions (see para 9 of these instructions). 9. In the subjects of M.Ed., M.P.Ed., M.A. (Kannada), M.A. (Marathi), M.A. (Persian), M.A. (Psychology), M.A. (Tamil), M.A. (Theatre Arts), M.Sc. (Nutrition & Dietetics), All PG Diploma Courses including PG Diploma in Taxation (under commerce stream) and in all 5 yrs. Integrated Programmes, the counselling for admission will be conducted separately. Similarly, the admissions under NCC/NSS/SPORTS, PH, CAP, TEACHER/LAB.ASST, and NIQ categories will also be conducted separately. The schedules for admission/counselling for these subjects/categories will be given along with the schedule of certificate verification, mentioned above. 10. For those subjects in whom the entrance tests were not conducted, the admissions will be done based on the merit in the qualifying examination.